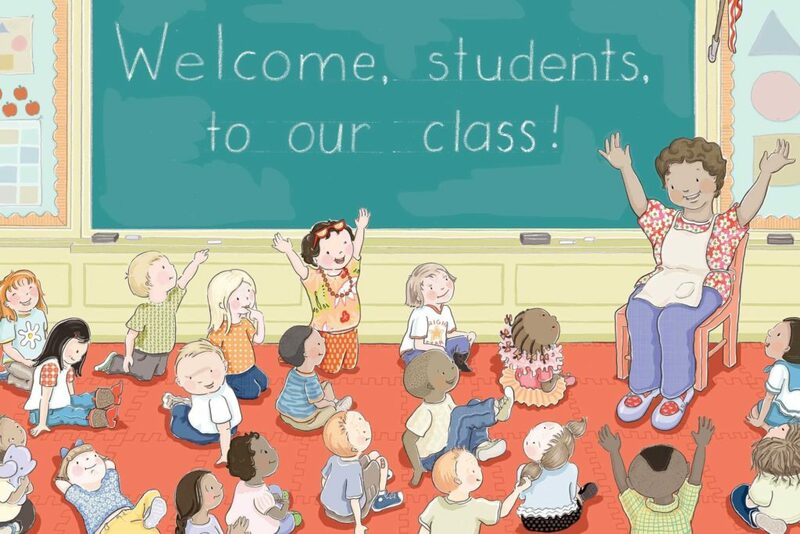 Home Uncategorized Welcome to THE CLASS! One of the unforeseen joys of writing and illustrating picture books has been that of making friends with other writer/illustrators, and seeing their books come out into the world. I think I’m often just as excited for and proud of them as when my own books come out. One of these dear friends is Kimberly Gee. We met in 2010 at an SCBWI conference, and bonded quickly when we were two of six illustrators chosen for the portfolio mentorship program. 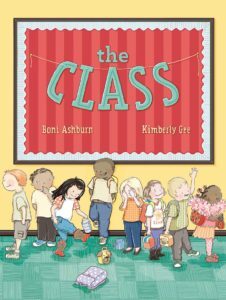 Her new book, The Class, written by Boni Ashburn and published by Beach Lane Books, S/S, came out in July, and I got to attend her book launch party in September, in time for all the ‘back-to-school’ excitement. I loved hearing her share the experience of working on this book so much that I had to invite her to come share about it with us, here. E: What was it about Boni Ashburn’s manuscript that excited you the most when you read it? K: I loved so many things about Boni’s manuscript! I knew right away that I wanted to illustrate The Class. There was no ‘thinking-it-over period’ on my end! Among the things I loved about the manuscript was the subject matter. The book flap describes it best: ‘It’s the morning of the first day of school, and all over town, twenty children are getting ready to become one wonderful class’. Specifically, twenty children are getting ready for THE first day of school— it’s the first day of Kindergarten. I just adored Kindergarten! I have very specific memories of my Kindergarten year, and there’s not a bad memory among them. And, I have elementary school age kids so getting kids ready for school is VERY much a part of my daily routine. I KNEW THIS subject! Aside from the subject, I thought the manuscript was just well written. Boni wrote it in rhyme and nailed it. It’s funny, rhythmic and absolutely appropriate to the audience. There’s even built-in counting opportunities- how perfect for Kindergarteners! E: What were the unique challenges to visualizing this text? How did you solve those challenges? In some early sketches, I’d experimented with a type of seek-and-find approach. I’d arranged the kids and things—organically, was what I was going for—what I got, though, was haphazard—a visual mess! I liken it to walking into your kid’s room when they’ve dumped every toy onto the floor. It’s overwhelming, and you just want to leave, right? I certainly didn’t want people to open the book just to close it! Lauren Rille, the Art Director suggested organizing the spots on the page in a sort of invisible grid or geometry with a lot of white space. That really helped the eye take in the details. Also, clarity was important for the counting aspect of the book. In a stroke of desperation and inspiration, I’d made a chart—a line-up of the characters, mostly to keep track of all the details. For example, if one kid is riding the bus to school, he/she can’t also be walking to school two spreads later! The chart broke it down and showed the spread each character was on and what detail I was tracking. The chart also allowed me to develop these kids as characters because I could visually SEE what detail they were assigned and keep them consistent. Before the chart—MAYHEM! After the chart—order. E: Since there are so many characters, there are so many moments with each of those characters as they make their way to school. Could you share a few of your favorite little moments? 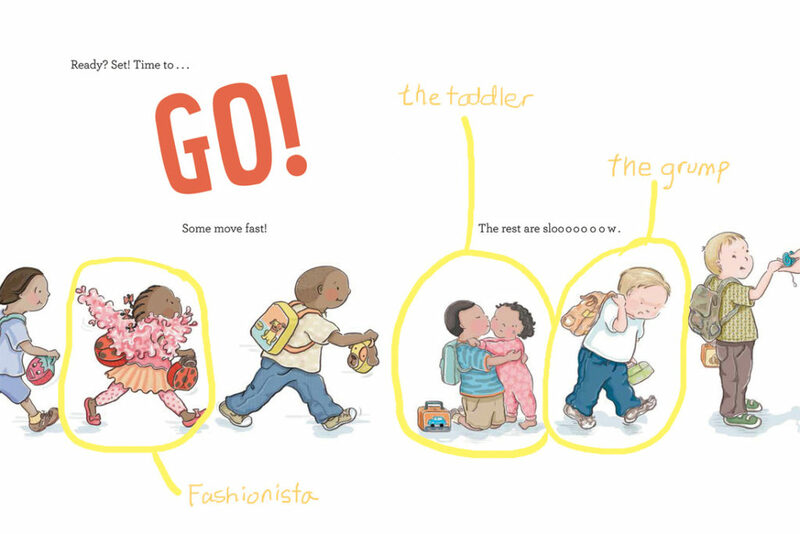 There’s a little story told in illustration only, that I’m pleased is in the book, because it is often a part of the first-day-of-school experience. I show a boy who has a toddler sister. She shows up when she interrupts her brother during an *awkward (bathroom! )* moment. A few spreads later she’s throwing punches at him, sobbing. What’s going on with this intrusive and abusive toddler?? Why add yet another character? Because it’s common for a kid to have a younger sibling who is NOT a part of the excitement, who does not understand what is going on, and who is then upset and acting out. When it’s time to GO!, I put brother in among those who move ‘slooooow’ so he can bend down to soothe her, plant a little kiss on her cheek. Then, sadly…one spread later…he almost misses the bus!! (it takes time to soothe toddler sisters)! 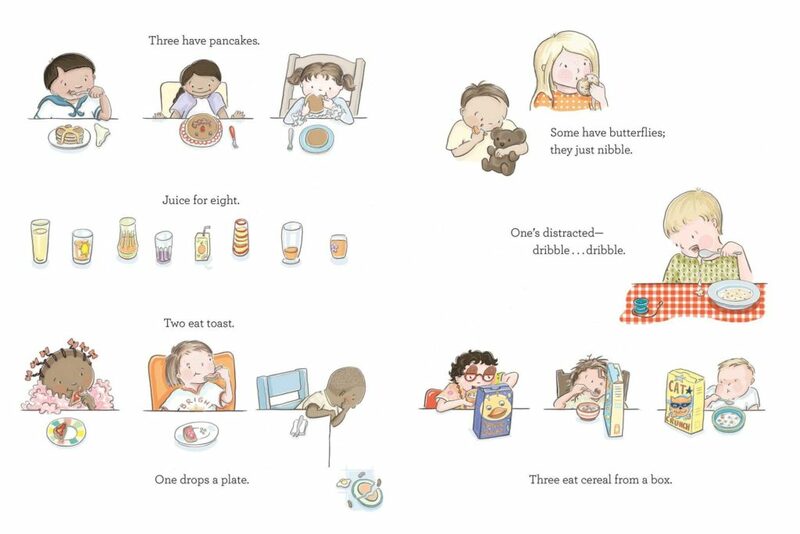 That’s an example of the many mini-stories in the book, told only in pictures. I got a kick out of them because again, I wanted these kids to be characters with personalities, for their little stories to be consistent—for them to have little stories. I’m partial to the grump because he mirrors how I often do ‘the first day of’ events! My nervousness shows up as grumpiness. I also like the fashionista with the boa and ribbons…she was just fun to dress! E: Thanks so much, Kimberly, for sharing with us! Congrats to you and Boni Ashburn on creating a wonderful book! I just read this book last night. I did enjoy trying to find all of the different characters as the book progressed. 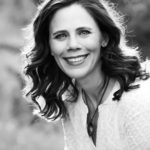 What a wonderful, warm story and that’s perfect for the first day of school, a family reunion, moving to a new neighborhood, or other related topics. Thanks so much for sharing. I love the addition of the toddler! This sounds so fun! I will have to check it out! I love the grid. What a wonderful tool for any number of characters. Love your illustrations, Kimberly! 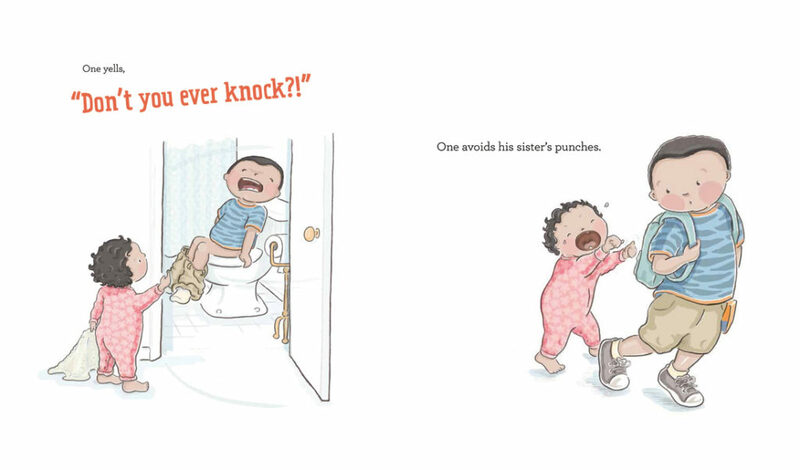 Such a cute book! Wow! What a cast of characters. I can’t wait to get my hands on a copy. Looks amazing! I read this book to my nervous kindergartner before he started school, and he loved it. Definitely helped put him at ease to see the specific characters, and he recognized himself in a few. Well done! I loved this first-hand account of the book helping prepare your kindergartner for this new experience. That’s so sweet! Thanks for sharing! ll be on the lookout for this one which is sure to become a kindergarten classic. This is SO great! Love the Chart too!!!! Kimberly’s character chart is a fabulous tool! Can’t wait to checkout The Class so I can read the whole story and the many mini ones. That chart–what a fantastic idea! This book looks like a first-day classic, and your art is adorable, Kimberly. Thanks for the interview, Eliza, and congrats to Kimberly and Boni! Loved this post! Fascinating to read about and see Kimberly’s process. Thanks! This book would make an excellent gift to any kindergarten child or teacher. I love the illustrations! Can’t wait to read it. Thanks. I’ll love following the characters. It must have been complex to create 20 characters! Can’t wait to see how you did it. I love the chart. Brilliant organizing idea. I cannot wait to read it. The chart is a great idea. Thanks for sharing that! 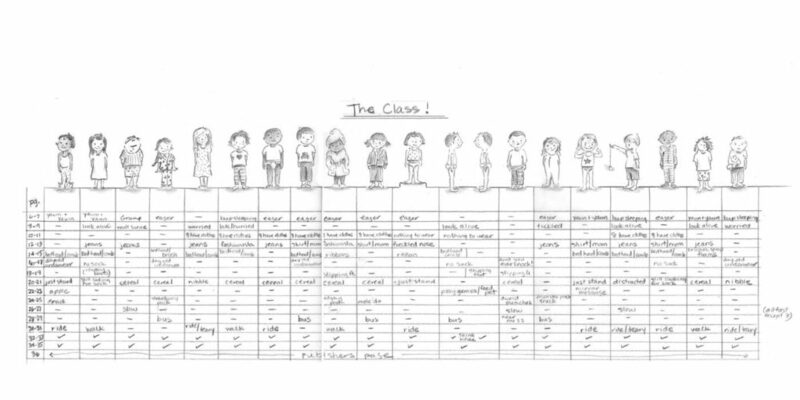 Love the story behind the story of The Class! I love your focus on the individuals, Kimberly. Truly a book with heart and humor. Thanks to everyone for all the wonderful comments! YES! Love this post. I am crazy about that chart, btw.